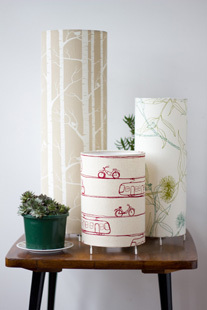 'Ink & Spindle's designs are largely inspired by their hometown Melbourne and Australia’s native flora and fauna. Instead of following current design, or fashion trends, they try to develop textiles that will fit in your life for many years to come. When it comes to finished product they prefer to collaborate with fellow local creatives. 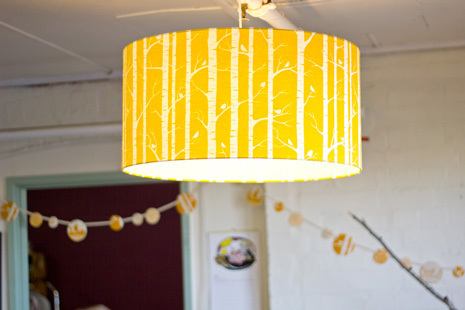 'Ink & Spindle's textiles can be found around Melbourne & Australia made in to bags, lampshades, homewares and more due to the skills of a range of talented people. Tegan and Lara feel it is very important to raise awareness and provide a sustainable alternative to the mass produced textiles that dominate the marketplace. Their ethical and environmental concerns effect all of their decision making and also how the studio functions. 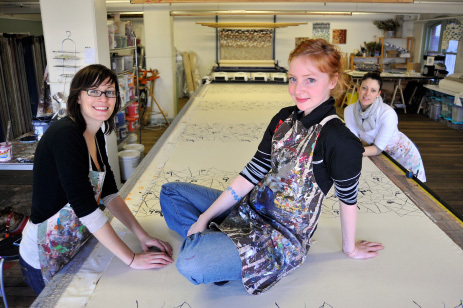 The studio is a bright, friendly and welcoming creative environment. Many friends and neighbours come through the doors to discuss collaborations, creativity, business ups and downs and life in general. Prior to 'Ink & Spindle', Lara had worked for many years as a web and graphic designer. Feeling somewhat frustrated and limited by the digital medium, she began to experiment with surface design and textiles, receiving a lot of feedback and support via her blog Kirin Notebook. From there, the progression to starting 'Ink & Spindle' was a natural one, and so much more fulfilling. Tegan studied Fine Arts for 5 years before completing a postgrad in Education and becoming a secondary school teacher. During her second year teaching, Ink & Spindle came to life, and although she felt teaching was the best job in the world, it was emotionally and creatively exhausting. Tegan found leaving teaching (or more specifically, her students) really difficult, but has found running 'Ink & Spindle' to be rewarding on so many levels.